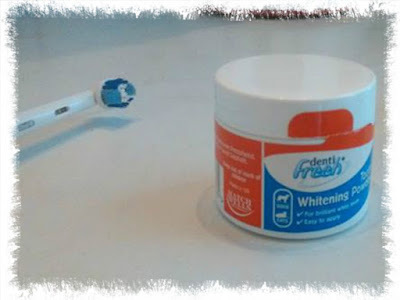 Because of pet smile month I wanted to do some reviews on products to keep dogteeth clean. One of my favorite is a discontinued produkt by a British company called Hatchwells. The product is called Denti Fresh tooth whitening powder. As the name suggests it is a powder. You can use it very easily on a toothbrush. There are special toothbrushes for dogs in store, but you can also use a regular one for humans. When our dogs where still puppy I always used a childrenstoothbrush, and I switch to a big toothbrush when they are almost fully grown. With this powder you just wet the brush and dip in into the powder, and start brushing the teeth. As mentioned in a previous post, this can be bit of a struggle, so try to keep calm, and start brushing your dogs teeth when he is just a little puppy. I myself start doing this when they are about 12 weeks of age. Also I can keep track of the period of changing their first teeth for their grown up teeth. If you do this regularly your dog will have no problems with cleaning teeth, and your dog will not have a smelly breath, and it will keep him healthy. It is a shame this product is discontinued, but If you can find it, just buy it, you won't regret it.